In 3-quart saucepan, heat milk over medium heat until it just begins to bubble around edges (do not boil). Remove from heat; stir in chocolate chips with whisk until melted. Cool slightly. In small bowl, stir together cold water and cornstarch until dissolved. Stir cornstarch mixture, condensed milk, eggs and vanilla into chocolate mixture. Heat to boiling over medium heat, stirring constantly with whisk. Boil 1 minute or until mixture thickens and coats the back of a metal spoon. Remove from heat; stir in butter. Spoon into crust. Cover; refrigerate at least 8 hours. In medium bowl, beat whipping cream with electric mixer on high speed until foamy; gradually add sugar, beating until soft peaks form. 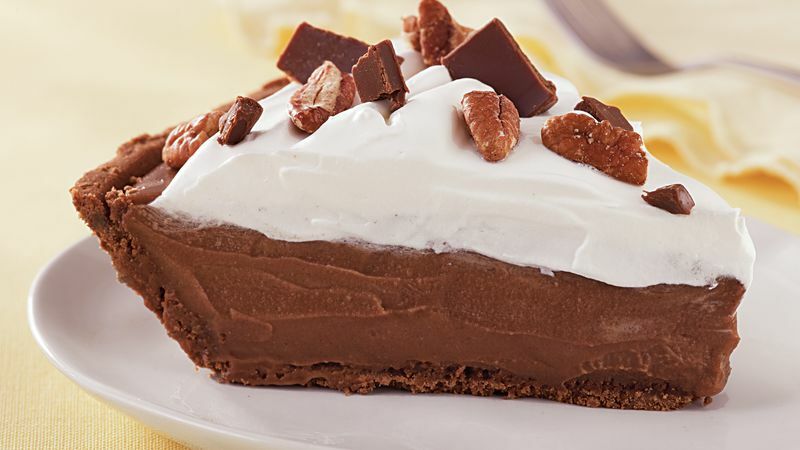 Spread whipped cream evenly over filling; sprinkle with pecans and chopped candy bar.